Bill McGlashan — the Silicon Valley investor caught in the middle of the college admissions cheating scandal — is girding for an epic legal battle over his severance, The Post has learned. The 55-year-old financier is prepared to square off against Texas-based buyout shop TPG over his share in a slew of lucrative investments he spearheaded for the firm — including early stakes in Uber, Airbnb and Box — that could be worth hundreds of millions of dollars, sources said. TPG is preparing to push back hard, according to insiders. The firm’s legal team, headed by former President Trump lawyer Marc Kasowitz, is expected to argue that McGlashan’s role in the scandal was enough to give TPG the right to deprive him of any severance — regardless of whether he resigned or was fired, according to a source close to the situation. 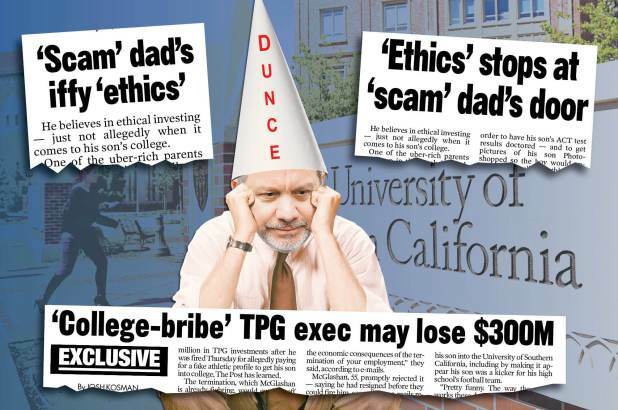 On March 14, McGlashan — who had just been busted by the FBI for allegedly paying $50,000 to have his son’s ACT scores doctored and a phony football profile created to get him into USC — sent an early-afternoon email to resign from TPG. “You have told me you will act fairly, and I am grateful,” McGlashan wrote at 1:02 p.m.
At 2:03 p.m., however, TPG co-Chief Executive Jon Winkelried emailed McGlashan a letter of termination, claiming that TPG was in the middle of drafting it when the company got his resignation. McGlashan pleaded not guilty to the FBI charges.